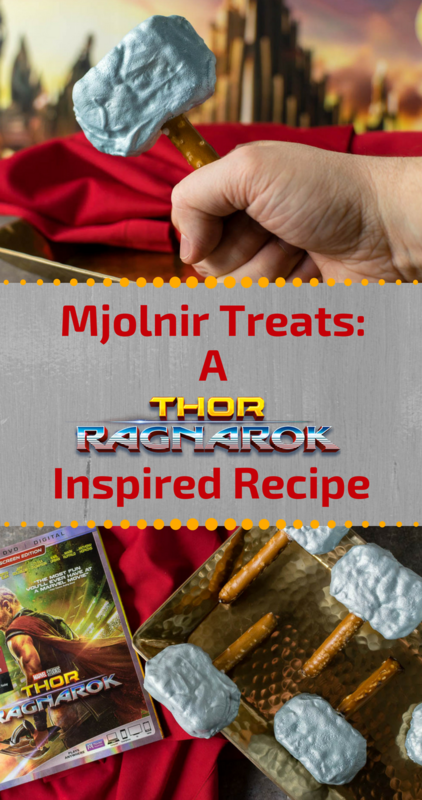 We received a copy of Thor: Ragnarok to help with creating our Mjolnir Treats. We love super hero movies! We had a ton of fun creating our Black Panther-inspired recipe. 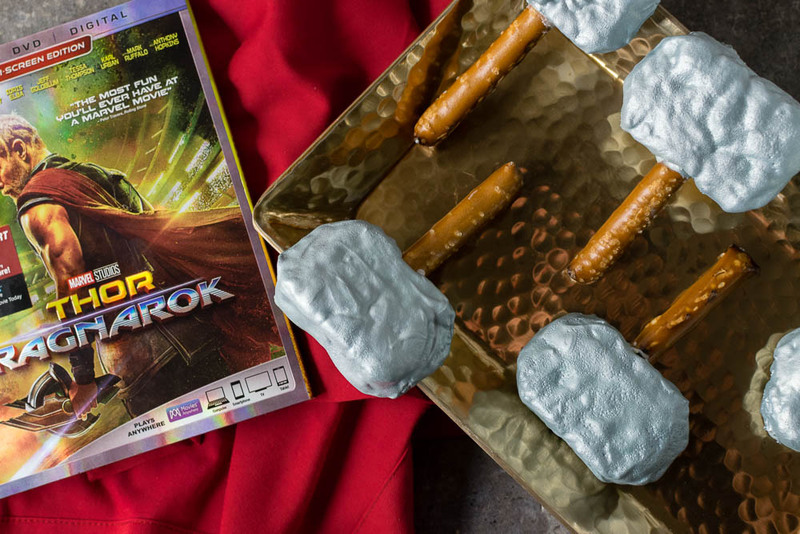 So when we were asked to create a recipe for the home release of Thor: Ragnarok we had to say yes! When the film came out in theaters we created a recipe for Hulk Smash Potatoes. This time however, we decided to focus on Thor. 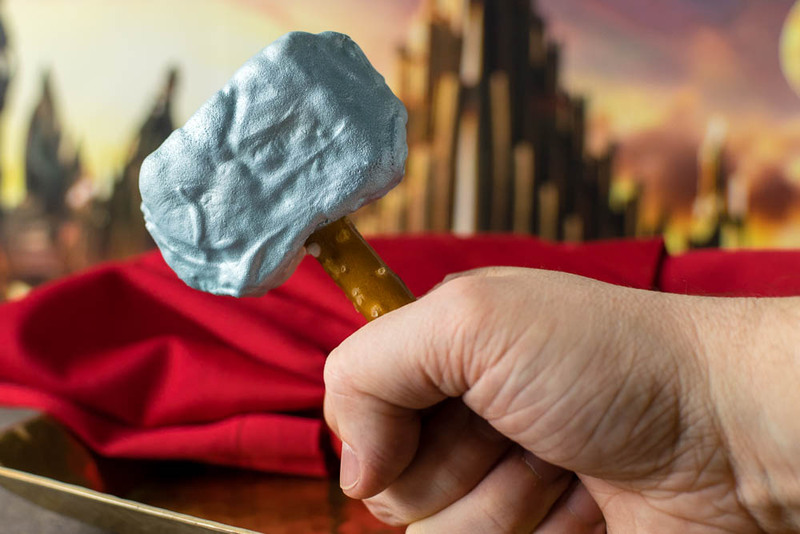 What better way than with Mjolnir Treats! At the time we created our first recipe for Thor: Ragnarok, we wanted to create a Mjolnir recipe. Sadly, at the time we couldn’t think of a way to do it that hadn’t already been done. Then it dawned on us, we could use something other than marshmallows! Rice Krispies Treats were the answer! With that and a few other ingredients, you’re well on your way to making a treat that is sure to impress! We hope you try out our Mjolnir Treats. They will be a rockin addition to you Thor: Ragnarok viewing party! Speaking of, like Loki, we have a little something up our sleeves! We are giving away 5 digital copies of Thor: Ragnarok! We’re giving them away on Instagram so be sure to follow us there to find out how you can win a copy! The winner will be picked on March 13th. Good luck! For those of you who just can’t wait, Thor: Ragnarok is out now on Blu-ray and Digital HD! Insert Pretzel Rod, making sure it is secure. Spoon melted chocolate over the Rice Krispy Treat portion. Allow chocolate to cool and harden. Once cooled, spray with shimmer spray. Allow the treats to dry. The Geeks were provided with a copy of Thor: Ragnarok for research purposes. All opinions are wholly our own. Giveaway digital copies of Thor: Ragnarok provided by Fingerpaint Marketing. View our Disclosure Policy for more info. I’ve seen so many recipes for tiny Mjolner treats made with marshmallows lately, but none made from rice crispies. What a brilliant idea. These are really good, I’ve never tried food spray or shaping rice crispies, I want to try this.